Also a huge thank you to Shawn Grady for participating! Thanks to both of these writers for their wonderful books! Keep 'em coming! Congratulations, Tanya!! A beautiful excerpt, well deserving of the win. Shawn, I adored your excerpt. Not my type of book at all, but I was bummed the excerpt was over. Am adding Through the Fire to my TBR pile! Thanks for playing along with us. Congrats, Tanya!!! Such a well-deserving win! 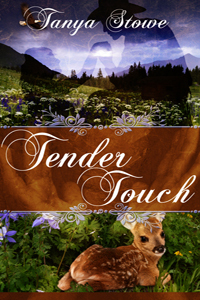 Loved Tender Touch. Woohooo, Tanya! I'm so proud of you! Tanya is enroute to the Middle East today, where she'll be living for two years. What an adventure! She asked me to let you all know how much she enjoyed participating in the COTT clash, and to thank COTT for the opportunity. Here's what she said: "This was the most fun I had in an interview in a long, long time. COTT does such a good job. I really appreciate this opportunity." I can't wait to let her know she won! Congrats, Tanya! And many thanks to all who participated!